Days are numbered for the Olympic Park Walking Tour, I am told, on the grounds that they are actually planning to finish the building site upon which it is based. Yesterday, I took the tour for the final time with my group of resilient games-seeking students, braving the inclement (i.e. freezing) weather conditions, the main roads and the unattractive Tesco at Bromley-by-Bow station, where it all starts. So, in case you do not get to experience the tour, here it is in pictures. 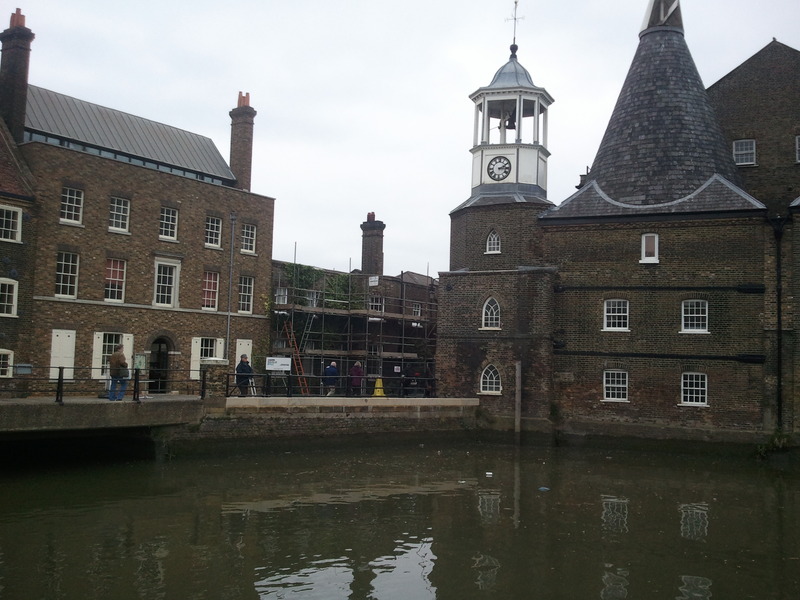 At Three Mills Island, we were regaled with tales of the smells of East London past – animal glue, animal fat soap, animal bone china, sewage works … I could go on. We looked at 3Mills Studios from the outside, and heard that Danny Boyle might actually be in there, planning the 2012 Opening Ceremony, at that very moment our knees were knocking on the cold cobbles below. 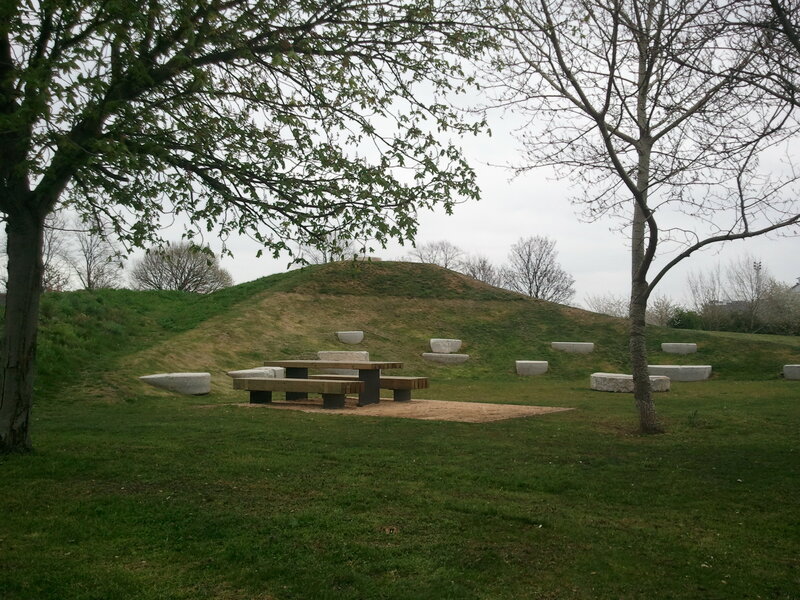 Then onto the Fat Walk, so called, apparently, because it is wide and has things on either side. Nothing to do with the current obesity moral panic, then. 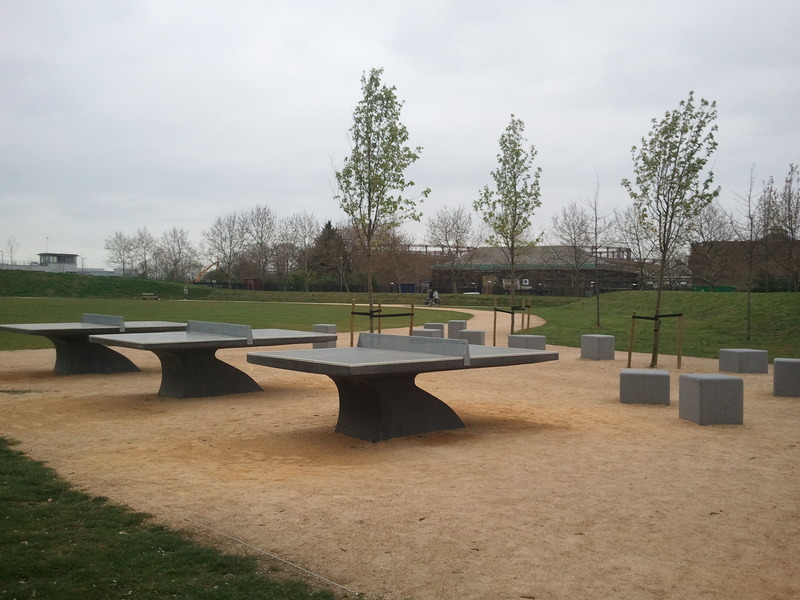 Since the last time I was there, table tennis tables have sprouted up as well as landscaped seating areas, like little sylvan grottos. 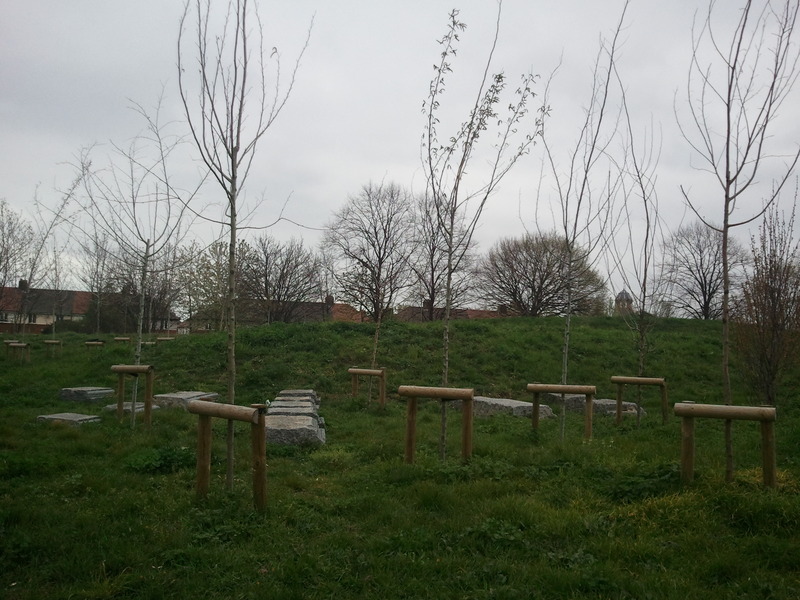 One day this new planting will be a thick wood, and these fragile saplings a mere memory, much like the Games themselves (actually, they’ll last a lot longer since the whole thing is going to be over in a matter of weeks). 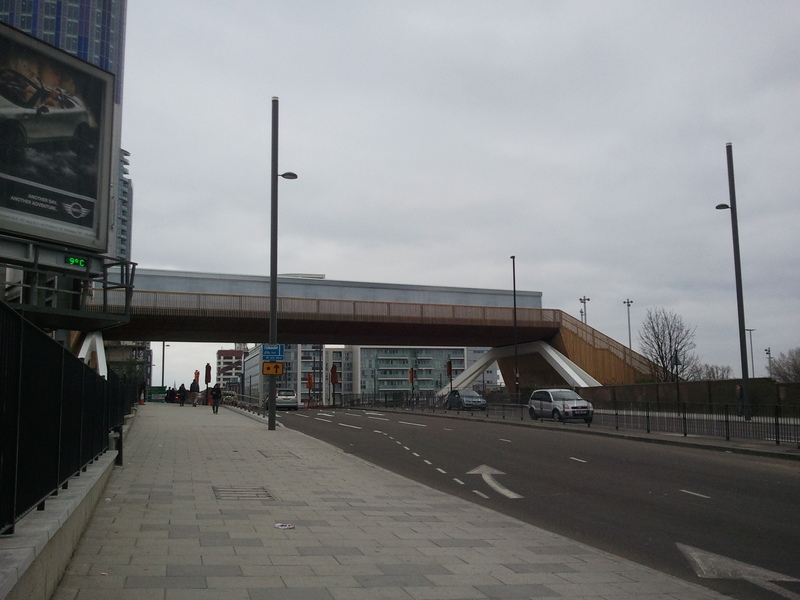 After the Fat Walk, we cross Stratford High Street and note the temporary bridge for the duration of the Olympics only. 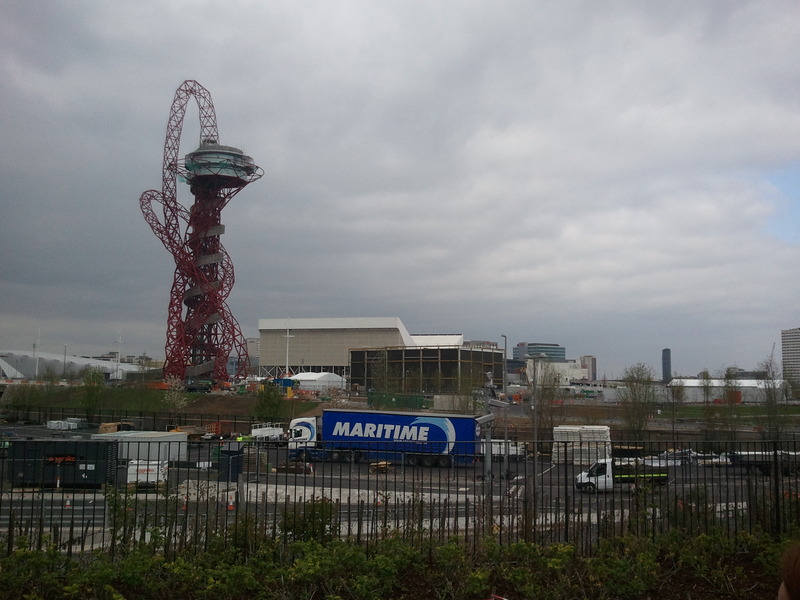 Finally we are in spitting distance of the building site and Pudding Mill Lane DLR station. As we made our way through the maze of hoardings, a panicked student enquired “is this the way people are going to come?” I was able to be reassuring: “No, this is the backway. They’re going to arrive through the Shopping Centre – you know, enter through the gift shop“. “OK, that makes sense”, was my student’s measured reply. The big news at the Olympic Park was evidence of the construction of the world’s largest Macdonalds (the square building with that recognisable green hue). The Olympic Stadium is coming along as well, and they’ve got the athlete training area finished. 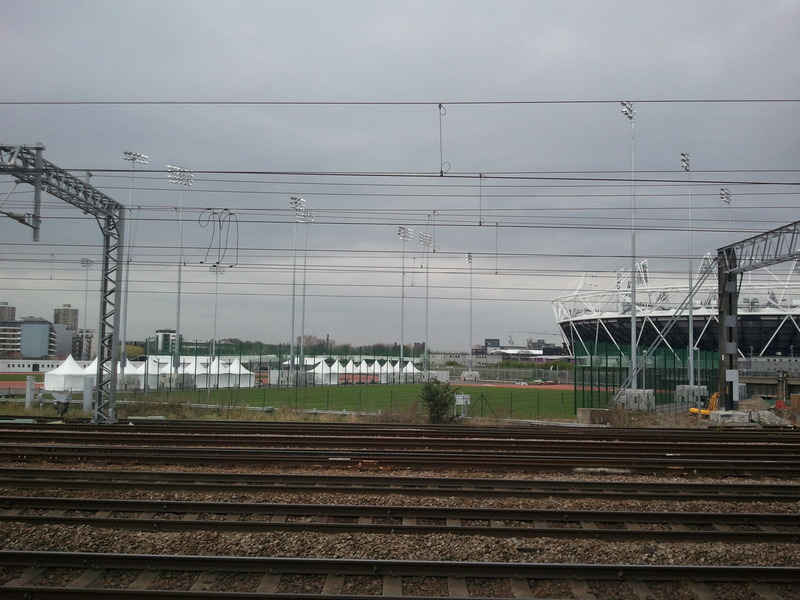 The view from the DLR to Stratford shows all the little tents, like a 21st Century jousting arena. This is Britain after all. 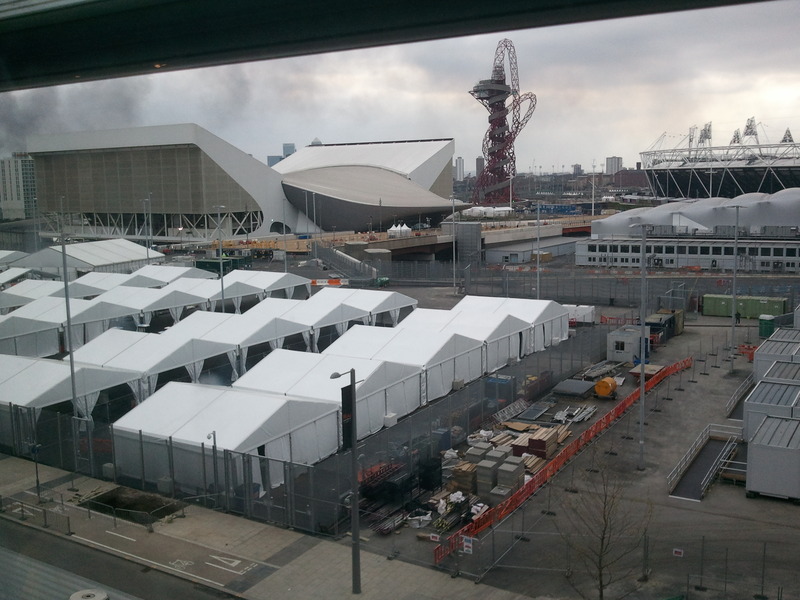 The viewing gallery at John Lewis gave once more upon the scene, and below we saw in readiness, not just the Aquatic Centre but the rows of security tents. We have already had first hand experience of both. In the next few days, Grumpy and I will be doing our own Olympic Walk. Inspired by the revelation of the route of the Olympic Torch Relay, we are planning to walk the Merton section in South London. Check back on Sunday to find out how we got on. This entry was posted in olympic building site and tagged fat walk, olympic park, walking tour by Eileen Kennedy. Bookmark the permalink.